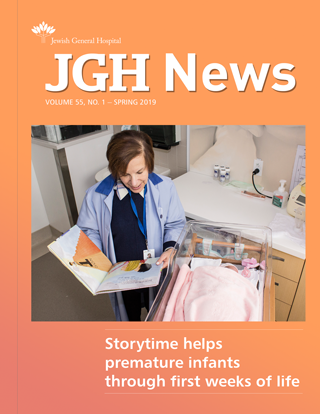 JGH News, the magazine of the Jewish General Hospital, has been a showcase for news, feature articles and human-interest stories about the JGH since the late 1950s. Published in French and English, JGH News is written in a clear, compelling style for a wide spectrum of readers. Not only does the magazine explore new developments in medical treatment, compassionate care and innovative research, it focuses on the staff, volunteers and donors who are essential to the hospital’s commitment of providing an exceptional patient experience. JGH News is an award-winner, recognized repeatedly by the Health Care Public Relations Association as one of the top publications by a Canadian healthcare institution.